Carbonate petrography is the study of limestones, dolomites and associated deposits under optical or electron microscopes greatly enhances field studies or core observations and can provide a frame of reference for geochemical studies. The strangest formations on Earth. Of these various reasons, faulting related to plate movements is by far the most signiﬁcant. 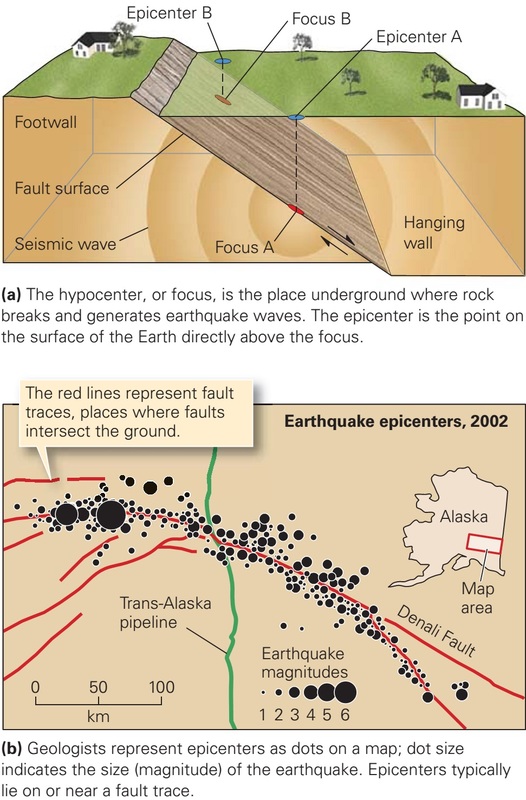 In other words, most earthquakes are due to slip on faults. As stated earlier, no one locality on Earth provides a complete record of our planet’s history, because stratigraphic columns can contain unconformities. But by correlating rocks from locality to locality at millions of places around the world, geologists have pieced together a composite stratigraphic column, called the geologic column, that represents the entirety of Earth history. Geometry of Folds Imagine a carpet lying ﬂat on the ﬂoor. Push on one end of the carpet, and it will wrinkle or contort into a series of wavelike curves. Stresses developed during mountain building can similarly warp or bend bedding and foliation (or other planar features) in rock. The result a curve in the shape of a rock layer is called a fold. There are different styles of volcano on the face of Earth and yes the subsurface too. Crater eruptions and fissure eruptions come from conduits of different shapes. Melting in the upper mantle and lower crust produces magma, which rises into the upper crust. Typically, this magma accumulates underground in a magma chamber, a zone of open spaces and/or fractured rock that can contain a large quantity of magma. A portion of the magma may solidify in the magma chamber and transform into intrusive igneous rock, whereas the rest rises through an opening, or conduit, to the Earth’s surface and erupts from a volcano. The conduit may have the shape of a vertical pipe, or chimney, or may be a crack called a ﬁssure (figure above a and b). At the top of a volcanic ediﬁce, a circular depression called a crater (shaped like a bowl, up to 500 m across and 200 m deep) may develop. Craters form either during eruption as material accumulates around the summit vent, or just after eruption as the summit collapses into the drained conduit. The formation of volcanic calderas. During major eruptions, the sudden draining of a magma chamber produces a caldera, a big circular depression up to thousands of meters across and up to several hundred meters deep. Typically, a caldera has steep walls and a fairly ﬂat ﬂoor and may be partially ﬁlled with ash. Geologists distinguish among several different shapes of subaerial (above sea level) volcanic ediﬁces. Shield volcanoes, broad, gentle domes, are so named because they resemble a soldier’s shield lying on the ground (a in figure above). They form when the products of eruption have low viscosity and thus are weak, so they cannot pile up around the vent but rather spread out over large areas. Scoria cones (informally called cinder cones) consist of cone-shaped piles of basaltic lapilli and blocks, generally from a single eruption (b in figure above). Strato-volcanoes, also known as composite volcanoes, are large and cone-shaped, generally with steeper slopes near the summit, and consist of interleaved layers of lava, tephra, and volcaniclastic debris (c in figure above). Their shape, exempliﬁed by Japan’s Mt. Fuji, supplies the classic image that most people have of a volcano; the preﬁx strato- emphasizes that they can grow to be kilometres high. 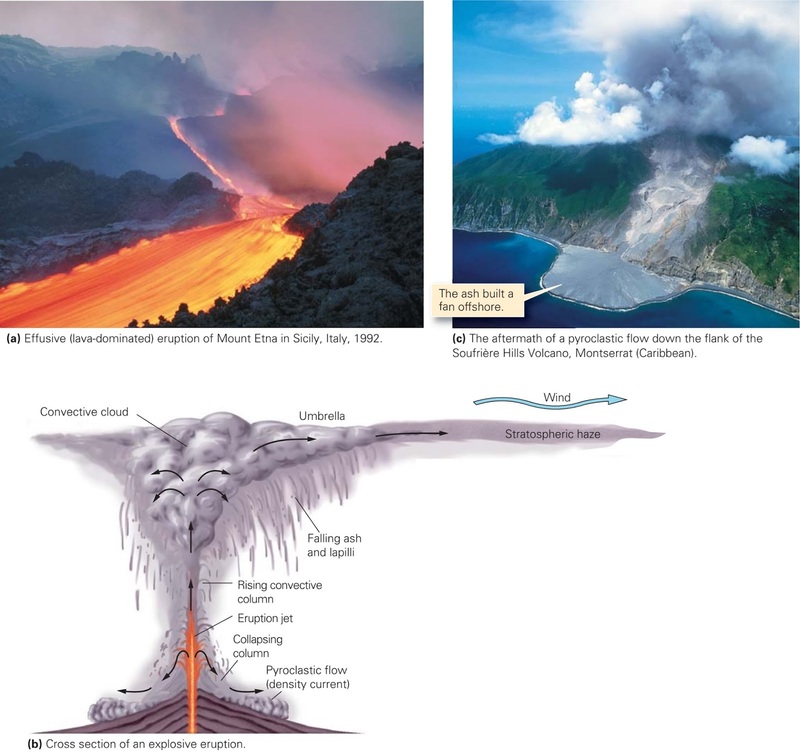 Concept of Eruptive Style: Will It Flow, or Will It Blow? Kilauea, a volcano on Hawaii, produces rivers of lava that cascade down the volcano’s ﬂanks. Mt. St. Helens, a volcano near the Washington–Oregon border, exploded catastrophically in 1980 and blanketed the surrounding countryside with tephra. Clearly, different volcanoes erupt differently and, as we've noted, successive eruptions from the same stratovolcano may differ markedly in character from one another. Geologists refer to the character of an eruption as eruptive style. 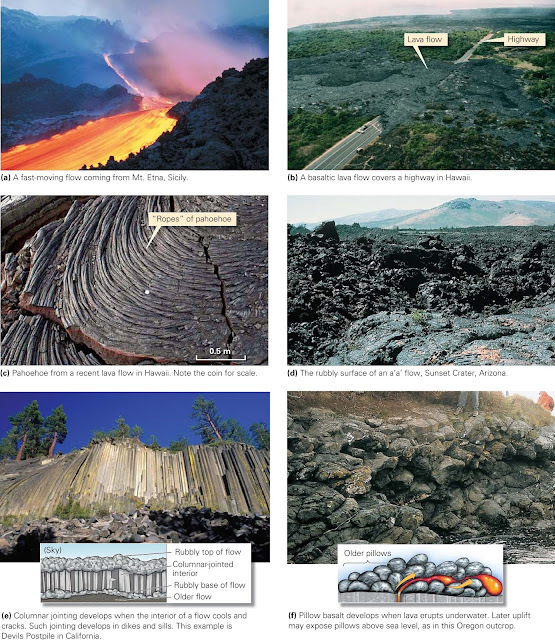 Below, we describe several distinct eruptive styles and explore why the differences occur. The term effusive comes from the Latin word for pour out, and indeed that’s what happens during an effusive eruption lava pours out a summit vent or ﬁssure, ﬁlling a lava lake around the crater and/or ﬂowing in molten rivers for great distances (a in figure above). Effusive eruptions occur where the magma feeding the volcano is hot and maﬁc and, therefore, has low viscosity. Pressure, applied to the magma chamber by the weight of overlying rock, squeezes magma upward and out of the vent; in some cases, the pressure is great enough to drive the magma up into a fountain over the vent. When pressure builds in a volcano, the eruption will likely yield an explosion. Smaller explosions take place during basaltic eruptions, when gas builds up and suddenly escapes, spattering lava drops and blobs upward these then solidify and fall as tephra. Occasionally, a volcano blows up in a huge explosion. Such catastrophic explosions can be triggered by many causes. For example, if a crack forms in the ﬂank of an island volcano, water will enter the magma chamber and suddenly turn to steam, the expansion of which blasts the volcano apart. Such explosions can also happen in felsic or andesitic volcanoes, if very viscous magma plugs the vent until huge pressure builds inside. If the plug eventually cracks, or the ﬂank of the volcano cracks, the gas inside the volcano suddenly expands, and like a giant shotgun blast, it sprays out the molten contents of the volcano and may cause the volcano itself to break apart. Such explosions, awesome in their power and catastrophic in their consequences, can eject cubic kilometres of debris outward. In some cases, the sudden draining of the magma chamber, and the ejection of debris, causes the remnants of the volcano to collapse and form a caldera. down Pelée’s ﬂank. Partly riding on a cushion of air, this ﬂow reached speeds of 300 km per hour, and slammed into St. Pierre. Within moments, all the town’s buildings had been ﬂattened and all but two of its 28,000 inhabitants were dead of incineration or asphyxiation. Similar eruptions have happened more recently on the nearby island of Montserrat, but with a much smaller death toll because of timely evacuation (c in figure above). 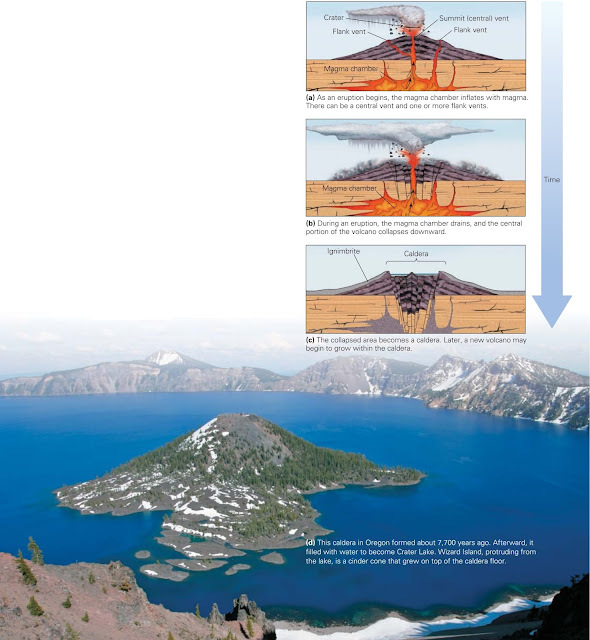 Note that the type of volcano (shield, cinder cone, or composite) depends on its eruptive style. 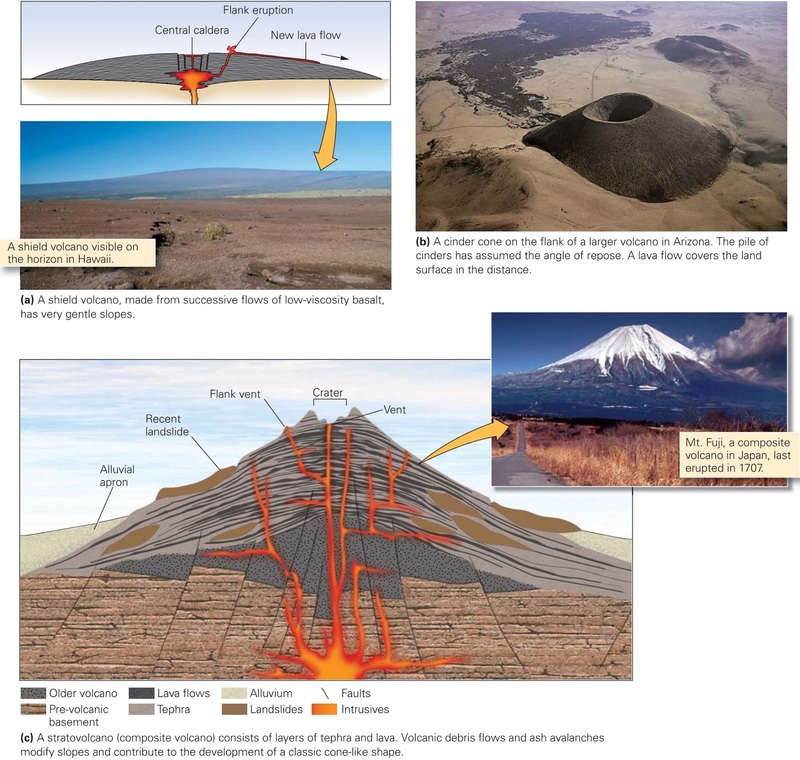 Volcanoes that have only effusive eruptions become shield volcanoes, those that generate small pyroclastic eruptions due to fountaining basaltic lava yield cinder cones, and those that alternate between effusive and large pyroclastic eruptions become composite volcanoes (stratovolcanoes). Large explosions yield calderas and blanket the surrounding countryside with ash and/or ignimbrites. Why are there such contrasts in eruptive style? Eruptive style depends on the viscosity and gas contents of the magma in the volcano. These characteristics, in turn, depend on the composition and temperature of the magma and on the environment (subaerial or submarine) in which the eruption occurs. Traditionally, geologists have classiﬁed volcanoes according to their eruptive style, each style named after a well known example. The drama of a volcanic eruption transfers materials from inside the Earth to our planet’s surface. Products of an eruption come in three forms lava ﬂows, pyroclastic debris, and gas. Note that we use the name ﬂow for both a molten, moving layer of lava and for the solid layer of rock that forms when the lava freezes. The character of a lava flow depends on its viscosity. Sometimes it races down the side of a volcano like a fast moving, incandescent stream, sometimes it builds into a rubble-covered mound at a volcano’s summit, and sometimes it oozes like a sticky but scalding paste. Clearly, not all lava behaves in the same way when it rises out of a volcano. Therefore, not all lava ﬂows look the same. Why? The character of a lava primarily reﬂects its viscosity (resistance to ﬂow), and not all lavas have the same viscosity. Differences in viscosity depend, in turn, on chemical composition, temperature, gas content, and crystal content. Silica content plays a particularly key role in controlling viscosity. Silica poor (basaltic) lava is less viscous, and thus ﬂows farther than does silica-rich (rhyolitic) lava (figure above). To illustrate the different ways in which lava behaves, we now examine ﬂows of different compositions. Features of basaltic lava flows. They have low viscosity thus can flow for long distances. Their surface and interior can be complex. 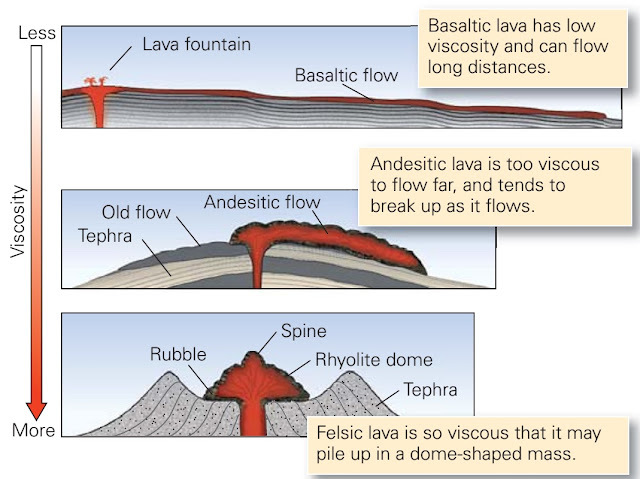 Basaltic (maﬁc) lava has very low viscosity when it ﬁrst emerges from a volcano because it contains relatively little silica and is very hot. Thus, on the steep slopes near the summit of a volcano, it can ﬂow very quickly, sometimes at speeds of over 30 km per hour (figure above a). The lava slows down to less-than-walking pace after it starts to cool (figure above b). Most ﬂows measure less than a few km long, but some ﬂows reach as far as 600 km from the source. How can lava travel such distances? Although all the lava in a ﬂow moves when it ﬁrst emerges, rapid cooling causes the surface of the ﬂow to crust over after the ﬂow has moved a short distance from the source. The solid crust serves as insulation, allowing the hot interior of the ﬂow to remain liquid and continue to move. As time progresses, part of the ﬂow’s interior solidiﬁes, so eventually, molten lava moves only through a tunnel-like passageway, or lava tube, within the ﬂow the largest of these may be tens of meters in diameter. In some cases, lava tubes drain and eventually become empty tunnels. The surface texture of a basaltic lava ﬂow when it ﬁnally freezes reﬂects the timing of freezing relative to its movement. Basalt ﬂows with warm, pasty surfaces wrinkle into smooth, glassy, rope-like ridges; geologists have adopted the Hawaiian word pahoehoe (pronounced “pa-hoy-hoy”) for such ﬂows (figure above c). If the surface layer of the lava freezes and then breaks up due to the continued movement of lava underneath, it becomes a jumble of sharp, angular fragments, creating a rubbly ﬂow also called by its Hawaiian name, a’a’ (pronounced “ah-ah”) (figure above d). Footpaths made by people living in basaltic volcanic regions follow the smooth surface of pahoehoe rather than the foot-slashing surface of a’a’. During the ﬁnal stages of cooling, lava ﬂows contract, because rock shrinks as it loses heat, and may fracture into polygonal columns. This type of fracturing is called columnar jointing (figure above e). Basaltic ﬂows that erupt underwater look different from those that erupt on land because the lava cools so much more quickly in water. Because of rapid cooling, submarine basaltic lava can travel only a short distance before its surface freezes, producing a glass-encrusted blob, or “pillow” (figure above f). The rind of a pillow momentarily stops the ﬂow’s advance, but within minutes the pressure of the lava squeezing into the pillow breaks the rind, and a new blob of lava squirts out, freezes, and produces another pillow. In some cases, successive pillows add to the end of previous ones, forming worm-like chains. This rhyolite dome formed about 650 years ago, in Panum Crater, California. Tephra (cinders) accumulated around the vent. Because of its higher silica content and thus its greater viscosity, andesitic lava cannot ﬂow as easily as basaltic lava. When erupted, andesitic lava ﬁrst forms a large mound above the vent. This mound then advances slowly down the volcano’s ﬂank at only about 1 to 5 m a day, in a lumpy ﬂow with a bulbous snout. Typically, andesitic ﬂows are less than a few km long. Because the lava moves so slowly, the outside of the ﬂow has time to solidify; so as it moves, the surface breaks up into angular blocks, and the whole ﬂow looks like a jumble of rubble called blocky lava. Rhyolitic lava is the most viscous of all lavas because it is the most silicic and the coolest. Therefore, it tends to accumulate either above the vent in a lava dome (figure above), or in short and bulbous ﬂows rarely more than 1 to 2 km long. Sometimes rhyolitic lava freezes while still in the vent and then pushes upward as a column-like spire up to 100 m above the vent. Rhyolitic ﬂows, where they do form, have broken and blocky surfaces. On a mild day in February 1943, as Dionisio Pulido prepared to sow the fertile soil of his ﬁeld 330 km (200 miles) west of Mexico City, an earthquake jolted the ground, as it had dozens of times in the previous days. But this time, to Dionisio’s amazement, the surface of his ﬁeld visibly bulged upward by a few meters and then cracked. Ash and sulfurous fumes ﬁlled the air, and Dionisio ﬂed. When he returned the following morning, his ﬁeld lay buried beneath a 40-m-high mound of gray cinders Dionisio had witnessed the birth of Paricutín, a new volcano. During the next several months, Paricutín erupted continuously, at times blasting clots of lava into the sky like ﬁreworks. By the following year, it had become a steep-sided cone 330 m high. Nine years later, when the volcano ceased erupting, its lava and debris covered 25 square km. This description of Paricutín’s eruption, and that of Vesuvius at the beginning of this chapter, emphasizes that volcanoes can erupt large quantities of fragmental igneous material. Geologists use the general term volcaniclastic deposits for accumulations of this material. Volcaniclastic deposits include pyroclastic debris (from the Greek pyro, meaning ﬁre), which forms from lava that ﬂies into the air and freezes. They also include the debris formed when an eruption blasts apart pre-existing volcanic rock that surrounds the volcano’s vent, the debris that accumulates after tumbling down the volcano in landslides or after being transported in water-rich slurries, and the debris formed as lava ﬂows break up or shatter. Pyroclastic debris from basaltic eruptions. Basaltic magma rising in a volcano may contain dissolved volatiles (such as water). As such magma approaches the surface, the volatiles form bubbles. When the bubbles reach the surface, they burst and eject clots and drops of molten magma upward to form dramatic fountains (figure above a). To picture this process, think of the droplets that spray from a newly opened bottle of soda. Solidiﬁcation of the pea-sized fragments of glassy lava and scoria produces a type of lapilli (from the Latin word for little stones). Pieces of this type of lapilli are informally known as cinders. Rarely, ﬂying droplets may trail thin strands of lava, which freeze into ﬁlaments of glass known as Pelé’s hair, after the Hawaiian goddess of volcanoes, and the droplets themselves freeze into tiny streamlined glassy beads known as Pelé’s tears. Apple- to refrigerator-sized fragments called blocks (figure above b) may consist of already-solid volcanic rock, broken up during the eruption such blocks tend to be angular and chunky. In some cases, however, blocks form when soft lava squirts out of the vent and then solidiﬁes such blocks, also known as bombs, have streaked, polished surfaces. The components of an explosive eruption. Andesitic or rhyolitic lava is more viscous than basalt, and may be more gas-rich. The lava ﬂows tend to be blocky to start with, and blocks of ﬂows may tumble down the volcano. Eruptions of these lavas also tend to be explosive. Debris ejected from explosive eruptions includes fragments of pumice and ash. Ash consists of particles less than 2 mm in diameter, made from both glass shards formed when frothy lava explosively breaks up during an eruption, and from pulverized pre-existing volcanic rock (figure above a). 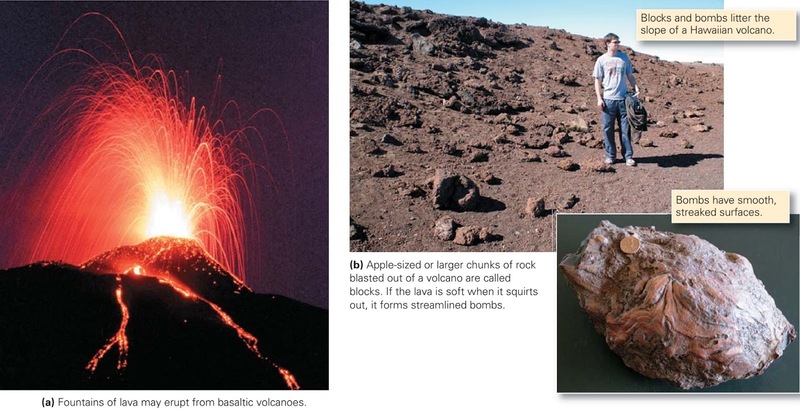 Two types of lapilli are produced by explosive eruptions: pumice lapilli consists of angular pumice fragments formed from frothy lava (figure above b); accretionary lapilli consists of snowball-like lumps of ash formed when ash mixes with water in the air and then sticks together (figure above c). Much of the pyroclastic debris erupted from an exploding volcano billows upward in a turbulent cloud that can reach stratospheric heights (figure above d). Some, however, rushes down the ﬂank of the volcano in an avalanche-like current known as a pyroclastic ﬂow (figure above e). Pyroclastic ﬂows were once known as nuées ardentes (French for glowing cloud), because the debris they contain can be quite hot 200C to 450C. Unconsolidated deposits of pyroclastic grains, regardless of size, constitute tephra. Ash, or ash mixed with lapilli, becomes tuff when buried and transformed into coherent rock. Tuff that formed from ash and/or pumice lapilli that fell like snow from the sky is called air-fall tuff, whereas a sheet of tuff that formed from a pyroclastic ﬂow is an ignimbrite. Ash and pumice lapilli in an ignimbrite is sometimes so hot that it welds together to form a hard mass. In cases where volcanoes are covered with snow and ice, or are drenched with rain, water mixes with debris to form a volcanic debris ﬂow that moves downslope like wet concrete. Very wet, ash-rich debris ﬂows become a slurry called a lahar, which can reach speeds of 50 km per hour and may travel for tens of kilometers. When debris ﬂows and lahars stop moving, they yield a layer consisting of volcanic debris suspended in ashy mud. 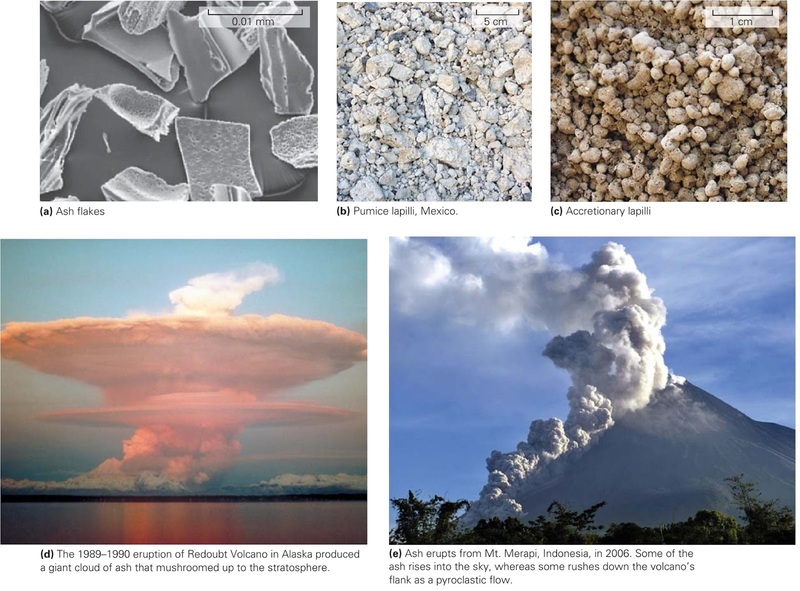 The gas component of volcanic eruptions. Most magma contains dissolved gases, including water, carbon dioxide, sulphur dioxide, and hydrogen sulphide (H2O, CO2, SO2, and H2S). In fact, up to 9% of a magma may consist of gaseous components, and generally, lavas with more silica contain a greater proportion of gas. Volcanic gases come out of solution when the magma approaches the Earth’s surface and pressure decreases, just as bubbles come out of solution in a soda when you pop the bottle top off. In low-viscosity magma, gas bubbles can rise faster than the magma moves, and thus most reach the surface of the magma and enter the atmosphere before the lava does. Thus some volcanoes may, for a while, produce large quantities of steam, without much lava (figure above a). The last bubbles to form, however, freeze into the lava and become holes called vesicles (figure above b). In high-viscosity magmas, the gas has trouble escaping because bubbles can’t push through the sticky lava. When this happens, explosive pressures build inside or beneath the volcano. Melting occurs only in special locations where conditions lead to decompression, addition of volatiles, and/or heat transfer. 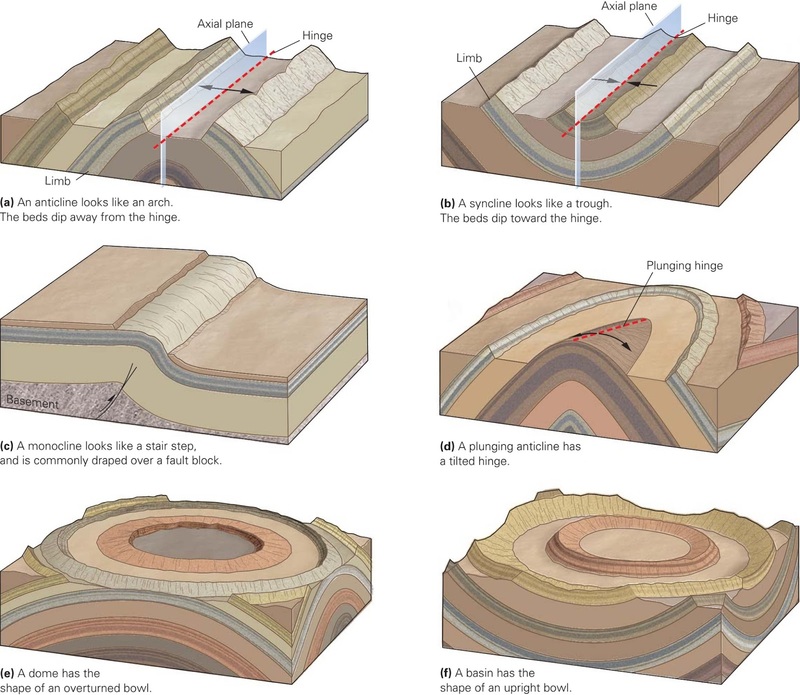 The conditions that lead to melting and, therefore, to igneous activity, can develop in four geologic settings: (figure below) (1) along volcanic arcs bordering oceanic trenches; (2) at hot spots; (3) within continental rifts; (4) along mid-ocean ridges. Let’s look more carefully at melting and igneous rock production at these settings, in the context of plate-tectonics theory, with a focus on the types of igneous rocks that may form in each setting. A chain of volcanoes, called a volcanic arc (or just an arc), forms on the overriding plate, adjacent to the deep-ocean trenches that mark convergent plate boundaries. The word “arc” emphasizes that many of these chains deﬁne a curve on a map. Continental arcs, such as the Andean arc of South America and the Cascade arc in the northwestern United States, grow along the edge of a continent, where oceanic lithosphere subducts beneath continental lithosphere. Island arcs, such as the Aleutian arc of Alaska and the Mariana arc of the western Paciﬁc, protrude from the ocean at localities where one oceanic plate subducts beneath another. Beneath volcanic arcs, a variety of intrusions plutons, dikes, and sills develop, to be exposed only later, when erosion has removed the volcanic overburden. In some localities, arc-related igneous activity produces huge batholiths. How does subduction trigger melting? Some minerals in oceanic crust rocks contain volatile compounds (mostly water). At shallow depths, volatiles are chemically bonded to the minerals. But when subduction carries crust down into the hot asthenosphere, “wet” crustal rocks warm up. At a depth of about 150 km, crust becomes so hot that volatiles separate from crustal minerals and diffuse up into the overlying asthenosphere. Addition of volatiles causes the hot ultramaﬁc rock in the asthenosphere to undergo partial melting, a process that yields maﬁc magma. This magma either rises directly, to erupt as basaltic lava, or undergoes fractional crystallization before erupting and evolves into intermediate or felsic lava. In continental volcanic arcs, not all the mantle-derived basaltic magma rises directly to the surface; some gets trapped at the base of the continental crust, and some in magma chambers deep in the crust. When this happens, heat transfers into the continental crust and causes partial melting of this crust. Because much of the continental crust is maﬁc to intermediate in composition to start with, the resulting magmas are intermediate to felsic in composition. This magma rises, leaving the basalt behind, and either cools higher in the crust to form plutons or rises to the surface and erupts. For this reason, granitic plutons and andesite lavas form at continental arcs. Most researchers think that hotspot volcanoes form above plumes of hot mantle rock from deep in the mantle, though some studies suggest that some hot spots may originate due to other processes happening at shallower depths. According to the plume hypothesis, a column, or “plume” of very hot rock rises like soft plastic up through the overlying mantle beneath a hot spot. (Note that a plume does not consist of magma; it is solid, though relatively soft and able to ﬂow.) When the hot rock of a plume reaches the base of the lithosphere, decompression causes it to undergo partial melting, a process that generates maﬁc magma. The maﬁc magma then rises through the lithosphere, pools in a magma chamber in the crust, and eventually erupts at the surface, forming a volcano. In the case of oceanic hot spots, mostly maﬁc magma erupts. In the case of continental hot spots, some of the maﬁc magma erupts to form basalt; but some transfers heat to the continental crust, which then partially melts itself, producing felsic magmas that erupt to form rhyolite. A map showing the distribution of large igneous provinces (LIPs) on Earth. The red areas are or once were underlain by immense volumes of basalt; not all of this basalt is exposed. In many places on Earth, particularly voluminous quantities of maﬁc magma have erupted and/or intruded (figure above). Some of these regions occur along the margins of continents, some in the interior of oceanic plates, and some in the interior of continents. The largest of these, the Ontong Java Oceanic Plateau of the western Paciﬁc, covers an area of about 5,000,000 km2 of the sea ﬂoor and has a volume of about 50,000,000 km3. Such provinces also occur on land. It’s no surprise that these huge volumes of igneous rock are called large igneous provinces (LIPs). More recently, this term LIP has been applied to huge eruptions of felsic ash too. Flood basalts form when vast quantities of low-viscosity maﬁc lava "ﬂoods" over the landscape and freezes into a thin sheet. Accumulation of successive ﬂows builds a ﬂat-topped plateau. Maﬁc LIPs may form when the bulbous head of a mantle plume ﬁrst reaches the base of the lithosphere. More partial melting can occur in a plume head than in normal asthenosphere, because temperatures are higher in a plume head. Thus, an unusually large quantity of unusually hot basaltic magma forms in the plume head; when the magma reaches the surface, huge quantities of basaltic lava spew out of the ground. If the plume head lies beneath a rift, added decompression can lead to even more melting (figure above a). The particularly hot basaltic lava that erupts at such localities has such low viscosity that it can ﬂow tens to hundreds of kilometres across the landscape. 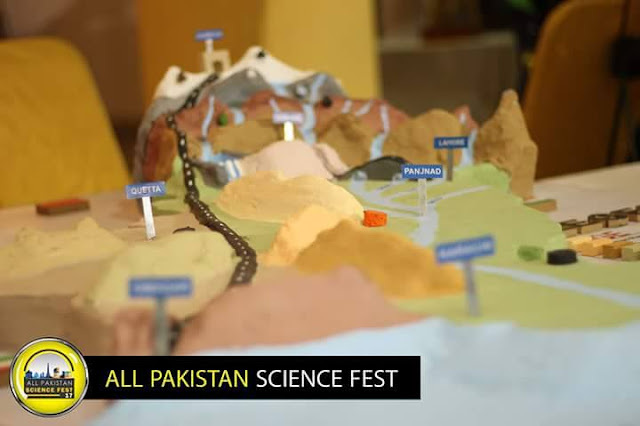 Geoscientists refer to such ﬂows as ﬂood basalts. 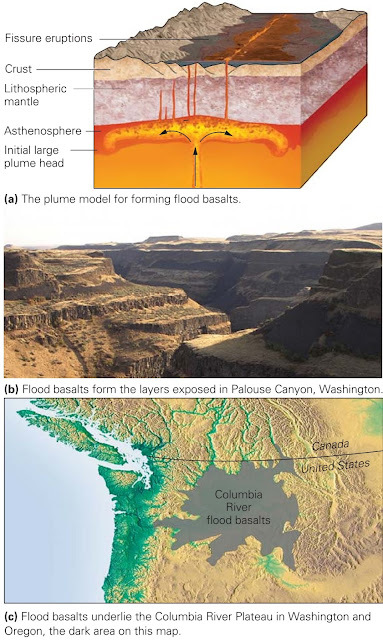 Flood basalts make up the bedrock of the Columbia River Plateau in Oregon and Washington (figure above b and c), the Paraná Plateau in southeastern Brazil, the Karoo region of southern Africa, and the Deccan region of southwestern India. Successful rifting splits a continent in two and gives birth to a new mid-ocean ridge. As the continental lithosphere thins during rifting, the weight of rock overlying the asthenosphere decreases, so pressure in the asthenosphere decreases and decompression melting produces basaltic magma, which rises into the crust. Some of this magma makes it to the surface and erupts as basalt. However, some of the magma gets trapped in the crust and transfers heat to the crust. The resulting partial melting of the crust yields felsic (silicic) magmas that erupt as rhyolite. Thus, a sequence of volcanic rocks in a rift generally includes basaltic ﬂows and sheets of rhyolitic lava or ash. Locally, the felsic and maﬁc magmas mix to form intermediate magma. 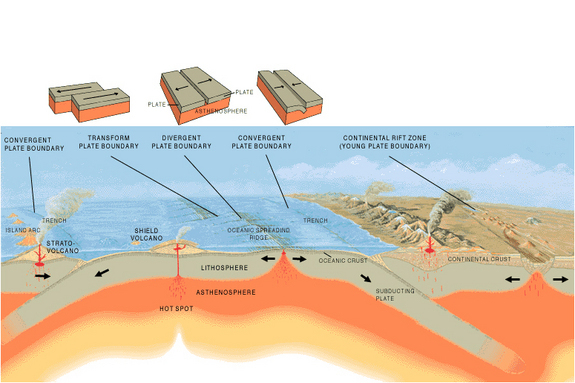 Most igneous rocks at the Earth’s surface form at mid-ocean ridges, that is, along divergent plate boundaries. Think about it the entire oceanic crust, a 7- to 10-km-thick layer of basalt and gabbro that covers 70% of the Earth’s surface, forms at mid-ocean ridges. And this entire volume gets subducted and replaced by new crust, over a period of about 200 million years. Igneous magmas form at mid-ocean ridges for much the same reason they do at hot spots and rifts. As sea-ﬂoor spreading occurs and oceanic lithosphere plates drift away from the ridge, hot asthenosphere rises to keep the resulting space ﬁlled. As this asthenosphere rises, it undergoes decompression, which leads to partial melting and the generation of basaltic magma. This magma rises into the crust and pools in a shallow magma chamber. Some cools slowly along the margins of the magma chamber to form massive gabbro, while some intrudes upward to ﬁll vertical cracks that appear as newly formed crust splits apart. Magma that cools in the cracks forms basalt dikes, and magma that makes it to the sea ﬂoor and extrudes as lava forms pillow basalt ﬂows. Textures and types of igneous rocks. Crystalline texture: Rocks that consist of minerals that grow when a melt solidifies interlock like pieces of a jigsaw puzzle (a in figure above). Rocks with such a texture are called crystalline igneous rocks. The interlocking of crystals in these rocks occurs because once some grains have developed, they interfere with the growth of later-formed grains. The last grains to form end up filling irregular spaces between already existing grains. Geologists distinguish subcategories of crystalline igneous rocks according to the size of the crystals. Coarse-grained (phaneritic) rocks have crystals large enough to be identified with the naked eye. Fine-grained (aphanitic) rocks have crystals too small to be identified with the naked eye. Porphyritic rocks have larger crystals surrounded by a mass of fine crystals. In a porphyritic rock, the larger crystals are called phenocrysts, while the mass of finer crystals is called ground mass. Fragmental texture: Rocks consisting of igneous chunks and/ or shards that are packed together, welded together, or cemented together after having solidified are fragmental igneous rocks (a in figure above). Glassy texture: Rocks made of a solid mass of glass, or of tiny crystals surrounded by glass, are glassy igneous rocks. Glassy rocks fracture conchoidally (b in figure above). What factors control the texture of igneous rocks? In the case of non-fragmental rocks, texture largely reﬂects cooling rate. The presence of glass indicates that cooling happened so quickly that the atoms within a lava didn't have time to arrange into crystal lattices. Crystalline rocks form when a melt cools more slowly. In crystalline rocks, grain size depends on cooling time. A melt that cools rapidly, but not rapidly enough to make glass, forms ﬁne-grained rock, because many crystals form but none has time to grow large (c figure above). A melt that cools very slowly forms a coarse-grained rock, because a few crystals have time to grow large. Because of the relationship between cooling rate and texture, lava ﬂows, dikes, and sills tend to be composed of ﬁne grained igneous rock. In contrast, plutons tend to be composed of coarse-grained rock. Plutons that intrude into hot wall rock at great depth cool very slowly and thus tend to have larger crystals than plutons that intrude into cool country rock at shallow depth, where they cool relatively rapidly. Porphyritic rocks form when a melt cools in two stages. First, the melt cools slowly at depth, so that phenocrysts form. Then, the melt erupts and the remainder cools quickly, so that groundmass crystallizes around the phenocrysts. There is, however, an exception to the standard cooling rate and grain size relationship. A very coarse-grained igneous rock called pegmatite doesn't necessarily cool slowly. Pegmatite contains crystals up to tens of centimetres across and occurs in dikes. Because pegmatite occurs in dikes, which generally cool quickly, the coarseness of the rock may seem surprising. Researchers have shown that pegmatites are coarse because they form from water-rich melts in which atoms can move around so rapidly that large crystals can grow very quickly. Because melts can have a variety of compositions and can freeze to form igneous rocks in many different environments above and below the surface of the Earth, we observe a wide spectrum of igneous rock types. We classify these according to their texture and composition. Studying a rock’s texture tells us about the rate at which it cooled, as we've seen, and therefore the environment in which it formed. Studying its composition tells us about the original source of the magma and the way in which the magma evolved before ﬁnally solidifying. Below, we introduce some of the more important igneous rock types. Igneous rocks are classiﬁed based on composition and texture. The scheme for classifying the principal types of crystalline igneous rocks is quite simple. The different compositional classes are distinguished on the basis of silica content ultramaﬁc, maﬁc, intermediate, or felsic whereas the different textural classes are distinguished according to whether the grains are coarse or ﬁne. 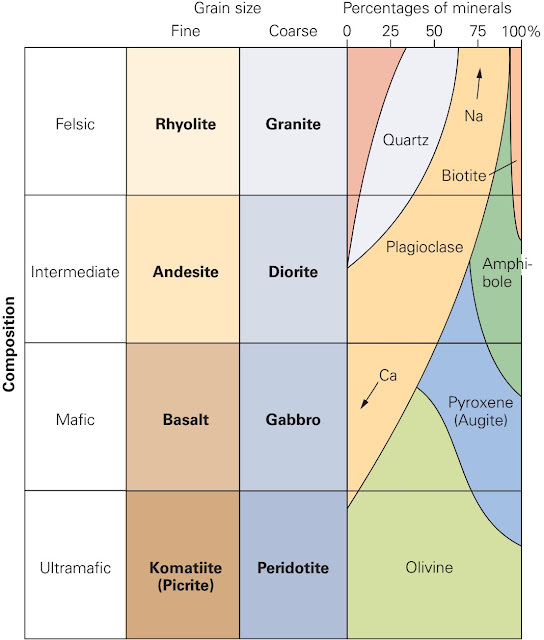 The chart in figure above gives the texture and composition of the most commonly used crystalline igneous rock names. As a rough guide, the colour of an igneous rock reﬂects its composition: maﬁc rocks tend to be black or dark Gray, intermediate rocks tend to be lighter Gray or greenish Gray, and felsic rocks tend to be light tan to pink or maroon. Note that rhyolite and granite have the same chemical composition but differ in grain size. Which of these two rocks develops from a melt of felsic composition depends on the cooling rate. A felsic lava that solidiﬁes quickly at the Earth’s surface or in a thin dike or sill turns into ﬁne-grained rhyolite; but the same magma, if solidifying slowly at depth in a pluton, turns into coarse-grained granite. A similar situation holds for maﬁc lavas a maﬁc lava that cools quickly in a lava ﬂow forms basalt, but a maﬁc magma that cools slowly forms gabbro. Glassy texture develops more commonly in felsic igneous rocks because the high concentration of silica inhibits the easy growth of crystals. But basaltic and intermediate lavas can form glass if they cool rapidly enough. In some cases, a rapidly cooling lava freezes while it still contains a high concentration of gas bubbles these bubbles remain as open holes known as vesicles. Geologists distinguish among several different kinds of glassy rocks. 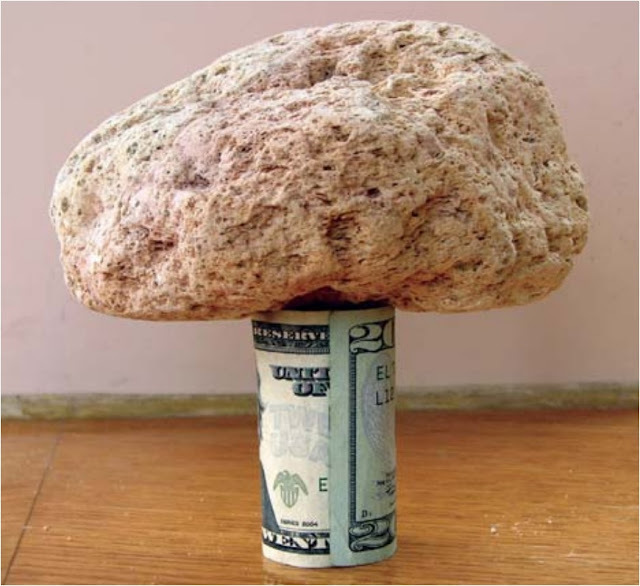 Pumice, a vesicle-filled volcanic rock, is so light that paper can hold it up. The vesicles it contains tend to be small. Obsidian is a mass of solid, felsic glass. It tends to be black or brown (b in first figure). Because it breaks conchoidally, sharp-edged pieces split off its surface when you hit a sample with a hammer. Pre- industrial people worldwide used such pieces for arrowheads, scrapers, and knife blades. Pumice is a felsic volcanic rock that contains abundant vesicles, giving it the appearance of a sponge. Pumice forms by the quick cooling of frothy lava that resembles the head of foam in a glass of beer. In some cases, pumice contains so many air-filled pores that it can actually float on water, like styrofoam (figure above). Scoria is a mafic volcanic rock that contains abundant vesicles (more than about 30%). Generally, the bubbles in scoria are bigger than those in pumice, and the rock, overall, looks darker. When volcanoes erupt explosively, they spew out fragments of lava. Geologists refer to all such fragments as pyroclasts. 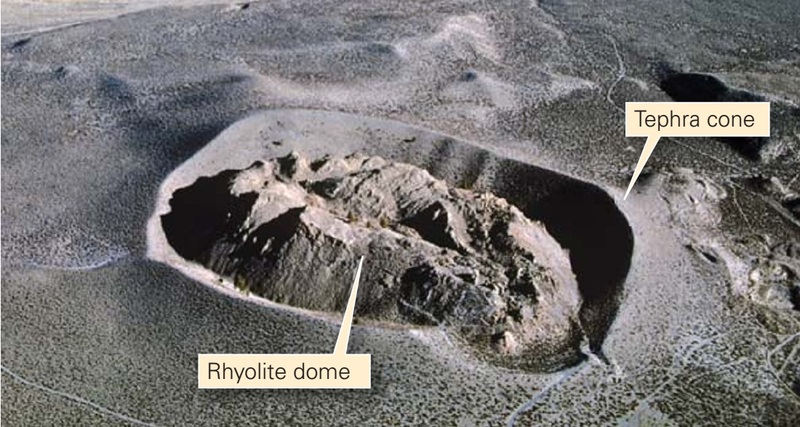 Accumulations of fragmental volcanic debris are called pyroclastic deposits, and when the material in these deposits consolidates into a solid mass, due either to welding together of still-hot clasts or to cementation by minerals precipitating from water passing through, it becomes a pyroclastic rock. Geologists distinguish among several types of pyroclastic rocks based on grain size. Let’s consider two examples. Tuff is a fine-grained pyroclastic igneous rock composed of volcanic ash. It may contain fragments of pumice. Volcanic breccia consists of larger fragments of volcanic debris that either fall through the air and accumulate, or form when a lava flow breaks into pieces. Why Does Magma Form, and What Is It Made of? Where does the heat that can cause the production of magma come from? Some of the Earth’s internal heat is a relict of the planet’s formation. In fact, during the ﬁrst 700 million years or so of its existence, the Earth was very hot, and at times may even have been largely molten. But our planet has had a long time to cool since then, and probably would have become too cool to melt at all were it not for the presence of radioactive elements. Every time a radioactive element decays, it generates new heat. The Earth produces enough radioactive heat to keep its inside quite hot. Even though the Earth is very hot inside, the popular image that the crust ﬂoats on a sea of molten rock is wrong. The crust and the mantle of this planet are almost entirely solid. Magma forms only in special places where preexisting solid rock undergoes melting. Below, we describe conditions that lead to melting. We’ll brieﬂy note the settings, in the context of plate tectonics, in which melting conditions develop, but will wait until the end of this chapter to characterize speciﬁc types of igneous rocks that form at these settings. The concept of decompression melting. Beneath typical oceanic crust, temperatures comparable to those of lava occur in the upper mantle (figure above a). But even though the upper mantle is very hot, its rock stays solid because it is also under great pressure from the weight of overlying rock, and pressure prevents atoms from breaking free of solid mineral crystals. Because pressure prevents melting, a decrease in pressure can permit melting. Thus, if the pressure affecting hot mantle rock decreases while the temperature remains unchanged, magma forms. 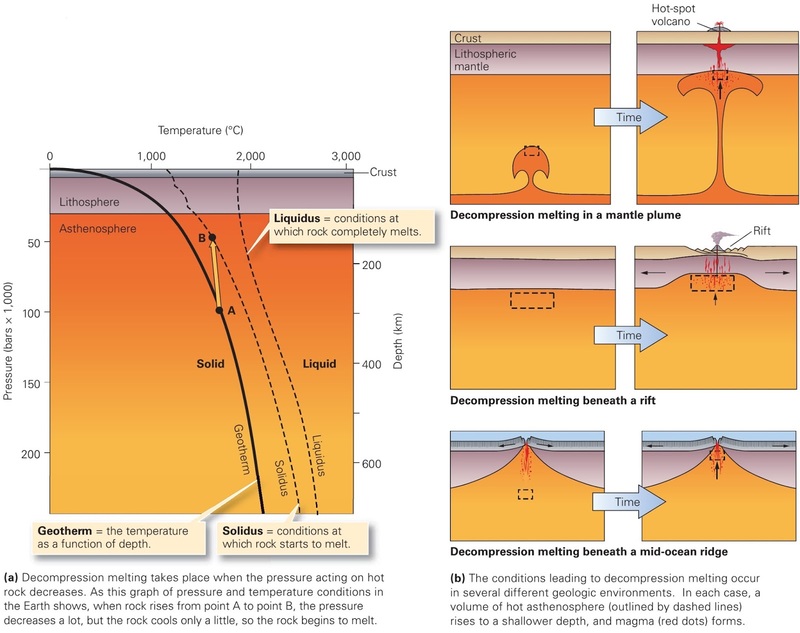 This kind of melting, called decompression melting, occurs where hot mantle rock rises to shallower depths in the Earth. Such movement occurs in mantle plumes, beneath rifts, and beneath midocean ridges (figure above b). Flux melting and heat-transfer melting. Magma also forms at locations where chemicals called volatiles mix with hot mantle rock. Volatiles, are substances such as water (H2O) and carbon dioxide (CO2) that evaporate easily and can exist in gaseous forms at the Earth’s surface. 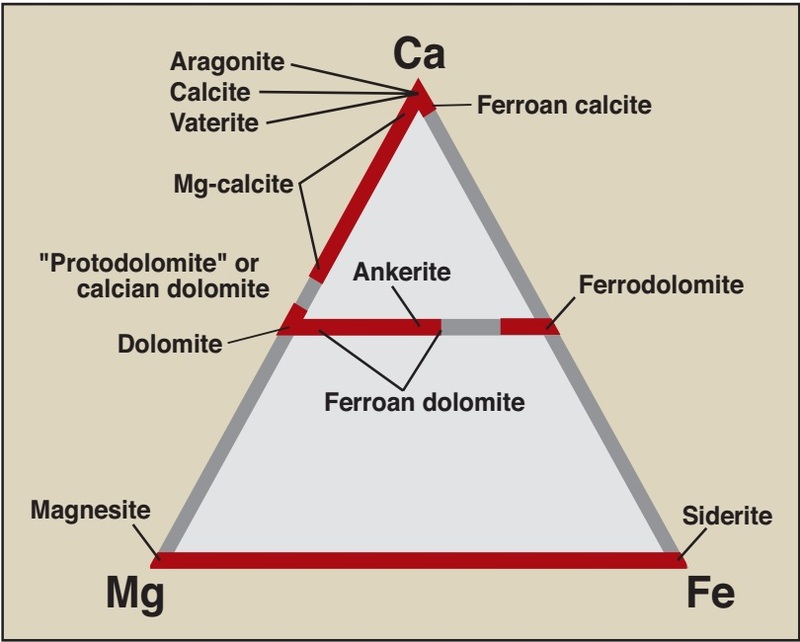 When volatiles mix with hot, dry rock, they help break chemical bonds so that the rock begins to melt (figure above a). In effect, adding volatiles decreases a rock’s melting temperature. Melting due to addition of volatiles is sometimes called ﬂux melting. When magma from the mantle rises up into the crust, it brings heat with it. This heat raises the temperature of the surrounding crustal rock and, in some cases, the rise in temperature may be sufﬁcient for the crustal rock to begin melting. To picture the process, imagine injecting hot fudge into ice cream; the fudge transfers heat to the ice cream, raises its temperature, and causes it to melt (figure above b). We call such melting heat transfer melting, because it results from the transfer of heat from a hotter material to a cooler one. All magmas contain silica, a compound of silicon and oxygen. But magmas also contain varying proportions of other elements such as aluminium (Al), calcium (Ca), sodium (Na), potassium (K), iron (Fe), and magnesium (Mg); each of these ions also bonds to oxygen to form a metal-oxide compound. Because magma is a liquid, its molecules do not lie in an orderly crystalline lattice but are grouped instead in clusters or short chains, relatively free to move with respect to one another. Geologists distinguish between “dry” magmas, which contain no volatiles, and “wet” magmas, which do. In fact, wet magmas include up to 15% dissolved volatiles such as water, carbon dioxide, nitrogen (N2), hydrogen (H2), and sulphur dioxide (SO2). These volatiles come out of the Earth at volcanoes in the form of gas. Usually, water constitutes about half of the gas erupting at a volcano. Thus, magma contains not only the molecules that constitute solid minerals in rocks but also the molecules that become water or air. Magmas differ from one another in terms of the proportions of chemicals that they contain. Geologists distinguish four major compositional types depending, overall, on the proportion of silica (SiO2) relative to other metal oxides (table above). Maﬁc magma contains a relatively high proportion of iron oxide (FeO or Fe2O3) and magnesium oxide (MgO) relative to silica. The “ma-” in the word stands for magnesium, and the “-ﬁc” comes from the Latin word for iron. Ultramaﬁc magma has an even higher proportion of magnesium and iron oxides, relative to silica. Felsic magmas have a relatively high proportion of silica, relative to magnesium and iron oxides. (Occasionally, geologists use the term “silicic” interchangeably with felsic.) Intermediate magma gets its name because its composition is partway between maﬁc and felsic. Why are there so many kinds of magma? 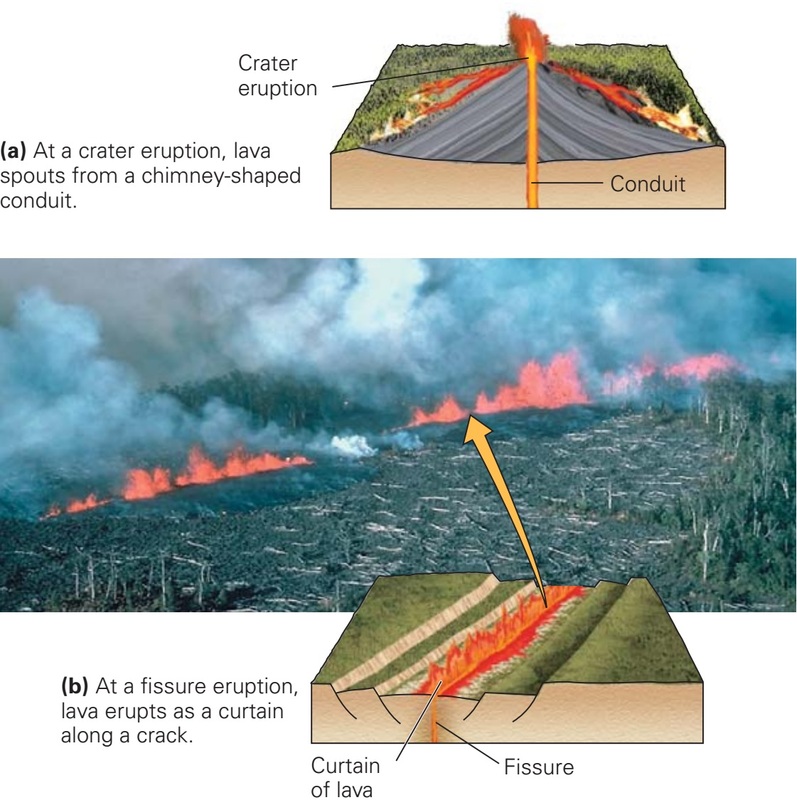 Several factors control magma composition, including those described below. Phenomena that can affect the composition of magma. Source rock composition: The composition of a melt reflects the composition of the solid from which it was derived. Not all magmas form from the same source rock, so not all magmas have the same composition. Partial melting: Under the temperature and pressure conditions that occur in the Earth, only about 2% to 30% of an original rock can melt to produce magma at a given location the temperature at sites of magma production simply never gets high enough to melt the entire original rock before the magma has a chance to migrate away from its source. Partial melting refers to the process by which only part of an original rock melts to produce magma (figure above a). Magmas formed by partial melting are more felsic than the original rock from which they were derived. For example, partial melting of an ultramafic rock produces a mafic magma. Assimilation: As magma sits in a magma chamber before completely solidifying, it may incorporate chemicals dissolved from the wall rocks of the chamber or from blocks that detached from the wall and sank into the magma (figure above b). This process is called contamination or assimilation. Magma mixing: Different magmas formed in different locations from different sources may enter a magma chamber. In some cases, the originally distinct magmas mix to create a new, different magma. Thoroughly mixing a felsic magma with a mafic magma in equal proportions produces an intermediate magma. Amateur and professional mineralogists get a kick out of identify minerals. They might hover around a display case in a museum and name specimens without bothering to look at the labels. How do they do it? The trick lies in learning to recognize the basic physical properties (visual and material characteristics) that distinguish one mineral from another. Some physical properties, such as shape and colour, can be seen from a distance. Others, such as hardness and magnetization, can be determined only by handling the specimen or by performing an identiﬁcation test on it. Identiﬁcation tests include scratching the mineral by another object, placing it near a magnet, weighing it, tasting it, or placing a drop of acid on it. Let’s examine some of the physical properties most commonly used in basic mineral identiﬁcation. Colour: Colour results from the way a mineral interacts with light. Sunlight contains the whole spectrum of colours; each colour has a different wavelength. A mineral absorbs certain wavelengths, so the colour you see when looking at a specimen represents the wavelengths the mineral does not absorb. Certain minerals always have the same colour, but many display a range of colours. Colour variations in a mineral are due to the presence of impurities. For example, trace amounts of iron may give quartz a reddish colour. Streak: The streak of a mineral refers to the colour of a powder produced by pulverizing the mineral. You can obtain a streak by scraping the mineral against an unglazed ceramic plate. The colour of a mineral powder tends to be less variable than the colour of a whole crystal, and thus provides a fairly reliable clue to a mineral’s identity. Calcite, for example, always yields a white streak even though pieces of calcite may be white, pink, or clear. Luster: Luster refers to the way a mineral surface scatters light. Geoscientists describe luster by comparing the appearance of the mineral with the appearance of a familiar substance. For example, minerals that look like metal have a metallic luster, whereas those that do not have a non-metallic luster. Terms used for types of non-metallic luster include silky, glassy, satiny, resinous, pearly, or earthy. Hardness: Hardness is a measure of the relative ability of a mineral to resist scratching, and it therefore represents the resistance of bonds in the crystal structure to being broken. The atoms or ions in crystals of a hard mineral are more strongly bonded than those in a soft mineral. Hard minerals can scratch soft minerals, but soft minerals cannot scratch hard ones. Diamond, the hardest mineral known, can scratch most anything, which is why it is used to cut glass. In the early 1800s, a mineralogist named Friedrich Mohs listed some minerals in sequence of relative hardness; a mineral with a hardness of 5 can scratch all minerals with a hardness of 5 or less. This list, the Mohs hardness scale, helps in mineral identification. To make the scale easy to use, common items such as your fingernail, a penny, or a glass plate have been added. Speciﬁc gravity: Speciﬁc gravity represents the density of a mineral, as represented by the ratio between the weight of a volume of the mineral and the weight of an equal volume of water at 4°C. For example, one cubic centimetre of quartz has a weight of 2.65 grams, whereas one cubic centimetre of water has a weight of 1.00 gram. Thus, the specific gravity of quartz is 2.65. In practice, you can develop a “feel” for specific gravity by hefting minerals in your hands. A piece of galena (lead ore) feels heavier than a similar-sized piece of quartz. Crystal habit: The crystal habit of a mineral refers to the shape of a single crystal with well-formed crystal faces, or to the character of an aggregate of many well-formed crystals that grew together as a group. The habit depends on the internal arrangement of atoms in the crystal. A description of habit generally includes adjectives that highlight the shape of the crystal. For example, crystals that are roughly the same length in all directions are called equant or blocky, those that are much longer in one dimension than in others are columnar or needle-like, those shaped like sheets of paper are platy, and those shaped like knives are bladed. Special properties: Some minerals have distinctive properties that readily distinguish them from other minerals. For example, calcite (CaCO3) reacts with dilute hydrochloric acid (HCl) to produce carbon dioxide (CO2) gas. Dolo mite (CaMg[CO3]2) also reacts with acid, but not as strongly. Graphite makes a gray mark on paper, magnetite attracts a magnet, halite tastes salty, and plagioclase has striations (thin parallel corrugations or stripes) on its surface. 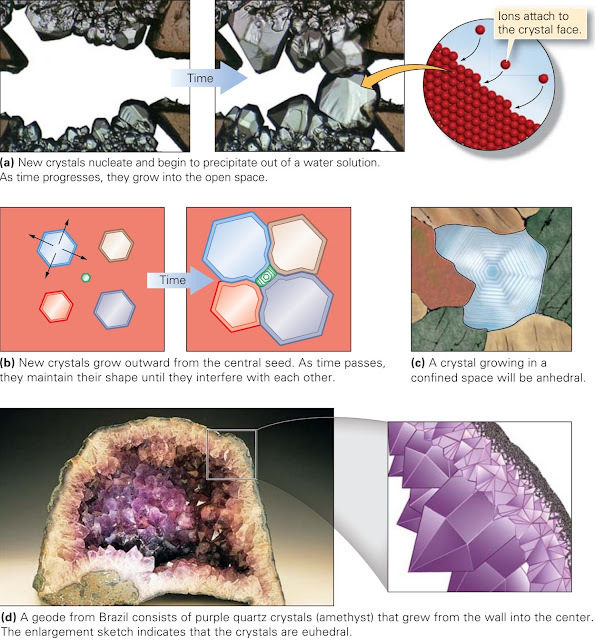 Fracture and cleavage: Different minerals fracture (break) in different ways, depending on the internal arrangement of atoms. If a mineral breaks to form distinct planar surfaces that have a specific orientation in relation to the crystal structure, then we say that the mineral has cleavage and we refer to each surface as a cleavage plane. Cleavage forms in directions where the bonds holding atoms together in the crystal are the weakest. Some minerals have one direction of cleavage. For example, mica has very weak bonds in one direction but strong bonds in the other two directions. Thus, it easily splits into parallel sheets; the surface of each sheet is a cleavage plane. Other minerals have two or three directions of cleavage that intersect at a specific angle. For example, halite has three sets of cleavage planes that intersect at right angles, so halite crystals break into little cubes. Materials that have no cleavage at all (because bonding is equally strong in all directions) break either by forming irregular fractures or by forming conchoidal fractures. Conchoidal fractures are smoothly curving, clamshell-shaped surfaces; they typically form in glass. Cleavage planes are sometimes hard to distinguish from crystal faces. The word crystal brings to mind sparkling chandeliers, elegant wine goblets, and shiny jewels. But, as is the case with the word mineral, geologists have a more precise deﬁnition. A crystal is a single, continuous (that is, uninterrupted) piece of a crystalline solid, typically bounded by ﬂat surfaces, called crystal faces, that grow naturally as the mineral forms. The word comes from the Greek krystallos, meaning ice. Many crystals have beautiful shapes that look like they belong in the pages of a geometry book. The angle between two adjacent crystal faces of one specimen is identical to the angle between the corresponding faces of another specimen. For example, a perfectly formed quartz crystal looks like an obelisk (a and b in figure above); the angle between the faces of the columnar part of a quartz crystal is always exactly 120°. This rule, discovered by one of the ﬁrst geologists, Nicolas Steno (1638– 1686) of Denmark, holds regardless of whether the whole crystal is big or small and regardless of whether all of the faces are the same size. Crystals come in a great variety of shapes, including cubes, trapezoids, pyramids, octahedrons, hexagonal columns, blades, needles, columns, and obelisks (c in figure above). Because crystals have a regular geometric form, people have always considered them to be special, perhaps even a source of magical powers. For example, shamans of some cultures relied on talismans or amulets made of crystals, which supposedly brought power to their wearer or warded off evil spirits. Scientists have concluded, however, that crystals have no effect on health or mood. For millennia, crystals have inspired awe because of the way they sparkle, but such behavior is simply a consequence of how crystal structures interact with light. Patterns and symmetry in minerals. What makes crystals have regular geometric forms? This problem was the focus of study for centuries. An answer ﬁnally came from the work of a German physicist, Max von Laue, in 1912. He showed that an X-ray beam passing through a crystal breaks up into many tiny beams to create a pattern of dots on a screen (a in figure above). Physicists refer to this phenomenon as diffraction; it occurs when waves interact with regularly spaced objects whose spacing is close to the wavelength of the waves you can see diffraction of ocean waves when they pass through gaps in a seawall. Von Laue concluded that, for a crystal to cause diffraction, atoms within it must be regularly spaced and the spacing must be comparable to the wavelength of X-rays. Eventually, Von Laue and others learned how to use X-ray diffraction patterns as a basis for deﬁning the speciﬁc arrangement of atoms in crystals. This arrangement deﬁnes the crystal structure of a mineral. If you’ve ever examined wallpaper, you’ve seen an example of a pattern. Crystal structures contain one of nature’s most spectacular examples of such a pattern (b in figure above). In crystals, the pattern is deﬁned by the regular spacing of atoms and, if the crystal contains more than one element, by the regular alternation of atoms (c in figure above). (Mineralogists refer to a 3-D geometry of points representing this pattern as a lattice.) The pattern of atoms in a crystal may control the shape of a crystal. For example, if atoms in a crystal pack into the shape of a cube, the crystal may have faces that intersect at 90° angles galena (PbS) and halite (NaCl) have such a cubic shape. Because of the pattern of atoms in a crystal structure, the structure has symmetry, meaning that the shape of one part of the structure is the mirror image of the shape of a neighboring part. For example, if you were to cut a halite crystal or a water crystal (snowﬂake) in half, and place the half against a mirror, it would look whole again (d in figure above). The nature of crystalline structure in minerals. The arrangement of atoms can be portrayed by a ball and stick model, or by a packed ball model. To illustrate crystal structures, we look at a few examples. Halite (rock salt) consists of oppositely charged ions that stick together because opposite charges attract. In halite, six chloride (Cl–) ions surround each sodium (Na+) ion, producing an overall arrangement of atoms that deﬁnes the shape of a cube (a and b in figure above). Diamond, by contrast, is a mineral made entirely of carbon. 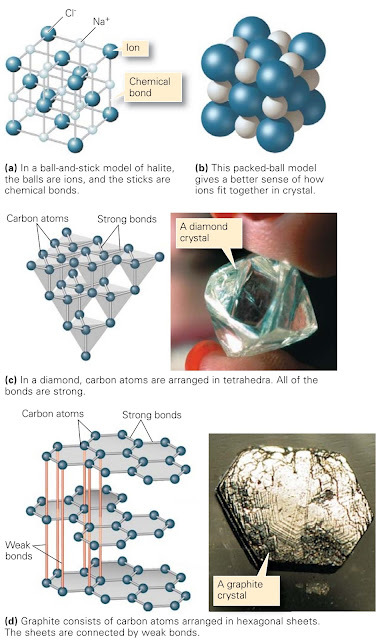 In diamond, each atom bonds to four neighbors arranged in the form of a tetrahedron; some naturally formed diamond crystals have the shape of a double tetrahedron (c in figure above). Graphite, another mineral composed entirely of carbon, behaves very differently from diamond. In contrast to diamond, graphite is so soft that we use it as the “lead” in a pencil; when a pencil moves across paper, tiny ﬂakes of graphite peel off the pencil point and adhere to the paper. This behaviour occurs because the carbon atoms in graphite are not arranged in tetrahedra, but rather occur in sheets (d in figure above). The sheets are bonded to each other by weak bonds and thus can separate from each other easily. Of note, two different minerals (such as diamond and graphite) that have the same composition but different crystal structures are polymorphs. New mineral crystals can form in ﬁve ways. First, they can form by the solidiﬁcation of a melt, meaning the freezing of a liquid to form a solid. For example, ice crystals, a type of mineral, are made by solidifying water, and many different minerals form by solidifying molten rock. Second, they can form by precipitation from a solution, meaning that atoms, molecules, or ions dissolved in water bond together and separate out of the water. Salt crystals, for example, precipitate when you evaporate salt water. Third, they can form by solid-state diffusion, the movement of atoms or ions through a solid to arrange into a new crystal structure, a process that takes place very slowly. For example, garnets grow by diffusion in solid rock. 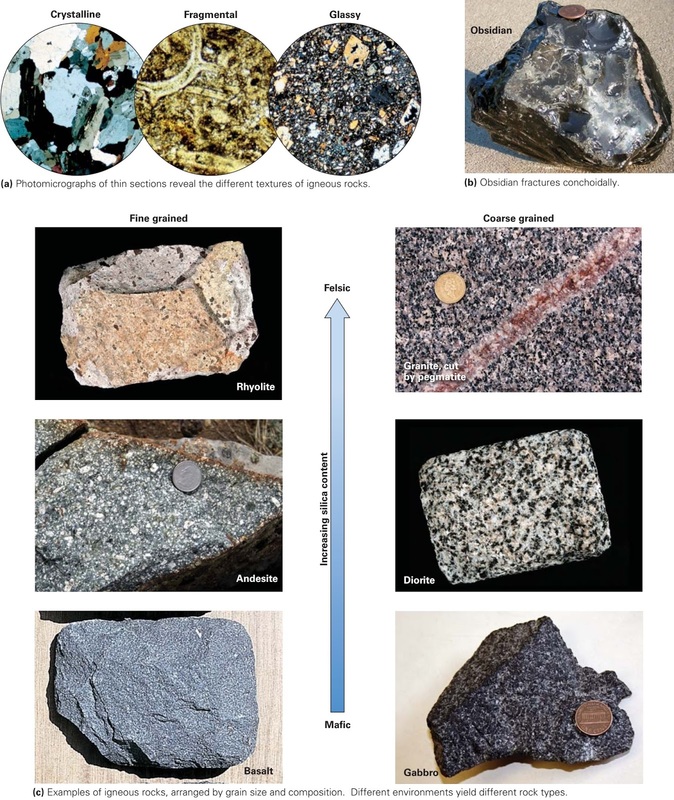 Fourth, minerals can form at interfaces between the physical and biological components of the Earth System by a process called biomineralization. This occurs when living organisms cause minerals to precipitate either within or on their bodies, or immediately adjacent to their bodies. For example, clams and other shelled organisms extract ions from water to produce mineral shells. Fifth, minerals can precipitate directly from a gas. This process typically occurs around volcanic vents or around geysers, for at such locations volcanic gases or steam enter the atmosphere and cool abruptly. Some of the bright yellow sulphur deposits found in volcanic regions form in this way. The ﬁrst step in forming a crystal is the chance formation of a seed, or an extremely small crystal (a in figure above). Once the seed exists, other atoms in the surrounding material attach themselves to the face of the seed. As the crystal grows, crystal faces move outward but maintain the same orientation (b in figure above). The youngest part of the crystal is at its outer edge. In the case of crystals formed by the solidiﬁcation of a melt, atoms begin to attach to the seed when the melt becomes so cool that thermal vibrations can no longer break apart the attraction between the seed and the atoms in the melt. Crystals formed by precipitation from a solution develop when the solution becomes saturated, meaning the number of dissolved ions per unit volume of solution becomes so great that they can get close enough to each other to bond together. As crystals grow, they develop their particular crystal shape, based on the geometry of their internal structure. The shape is deﬁned by the relative dimensions of the crystal (needle- like, sheet-like, etc.) and the angles between crystal faces. Typically, the growth of minerals is restricted in one or more directions, because existing crystals act as obstacles. In such cases, minerals grow to ﬁll the space that is available, and their shape is controlled by the shape of their surroundings. Minerals without well-formed crystal faces are anhedral grains (c in figure above). If a mineral’s growth is unimpeded so that it displays well-formed crystal faces, then it is a euhedral crystal. The surface crystals of a geode, a mineral-lined cavity in rock, may be euhedral (d in figure above). A mineral can be destroyed by melting, dissolving, or some other chemical reaction. Melting involves heating a mineral to a temperature at which thermal vibration of the atoms or ions in the lattice break the chemical bonds holding them to the lattice. The atoms or ions then separate, either individually or in small groups, to move around again freely. Dissolution occurs when you immerse a mineral in a solvent, such as water. Atoms or ions then separate from the crystal face and are surrounded by solvent molecules. Chemical reactions can destroy a mineral when it comes in contact with reactive materials. For example, iron-bearing minerals react with air and water to form rust. The action of microbes in the environment can also destroy minerals. In effect, some microbes can “eat” certain minerals; the microbes use the energy stored in the chemical bonds that hold the atoms of the mineral together as their source of energy for metabolism. We are currently working on our new website 'learninggeology.com' and will shift to it. This will be a comprehensive website including our new educational resources and many other different modules which we will disclose soon. How Can We Protect Against Mass Movement Disasters?